Location/Climate: 260 miles west-southwest of Kodiak, 450 miles southwest of Anchorage, on Pacific coast of Alaska Peninsula. 127"/yr. precip., 58"/yr. snowfall, 21°F60°F. Population: 141 (45.2 percent native, Aleut and Eskimo). Travel Attractions: Ferry link, access to Alaska Peninsula National Wildlife Refuge and Aniakchak Crater National Park. Getting There: Scheduled air service from King Salmon, scheduled ferry service from Homer and Kodiak. Information: Chignik Bay Village Council, 749-2220, cbaytc@aol.com. 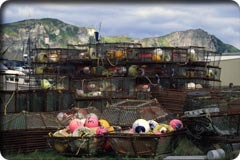 This small town about 260 miles southwest of Kodiak more than triples in population during fish-harvesting season. 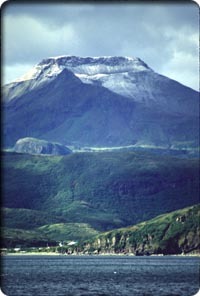 Its a possible base for explorations of the Alaska Peninsula Wildlife Refuge, Mount Veniaminof Volcano, the forested land around Chignik Lake (eastern limit of forest on the peninsula), and coastal islands. The sheltered waters of Chignik Bay offer kayaking possibilities. There are few travel-related services other than scheduled small-plane air service and a ferry link. Two old canneries built in the 1800s are worth a look. Aleutian Dragon Fisheries Guest House, 749-2282 (city number for information).